A pair of local teams were in need of a hero last week, and two athletes delivered to provide two memorable finishes already in the early parts of the spring season. Southington’s Evan Johanns and Newington’s Dani Pantano are this week’s Athletes of the Week for their ability to come through in the clutch and lead their teams to exciting wins when the tension was at its peak. The Southington boys lacrosse team was locked in a tight contest against Newington last Monday before senior attackman Evan Johanns went to work and seized momentum for the Blue Knights. Clinging to a one goal lead in the fourth quarter, Southington turned to their prolific goal scorer, who misfired on three straight shots during a man advantage before driving one home to give the Blue Knights some breathing room. It was the first of three straight goals for Johanns, who finished with a game-high eight total on the day. Southington closed that door thanks to Johanns’ timely goals that continued his torrid start to the season. Through the team’s first three games, Johanns had already racked up 17 goals, putting him almost halfway to his 2018 total of 40 goals. Johanns seems to have little trouble lighting up the goals column of the stat sheet, but in his senior season, he’s also looking to become a more efficient passer and lend a hand in goals for his teammates. Johanns wants to see his assist totals climb this year, but more importantly, he want to see the team’s win total climb, as Southington painfully missed the state tournament in 2018 by one game. If the Blue Knights receive more heroic performances like Johanns’ fourth quarter against the Indians, they should have no problem erasing last year’s disappointment with a state tournament berth this season. The Newington softball team was caught in a close game itself on Wednesday against Middletown, trailing by one heading into the bottom of the seventh. Pantano, who had allowed just one earned run in the circle, was already 3-for-3 at the plate when she laced a game-tying double to left field to score teammate Rachel Thureson, who had led off the frame with a single. The Indians did finish the job, and Maya Johnson came in to pinch run for Pantano and scored on a wild pitch, ending a thrilling win that was covered in Pantano’s fingerprints, from her performance on the rubber to her production at the plate. Pantano, a junior and a captain, has been heavily relied upon this season, as Newington boasts a number of young position players in need of veteran guidance. Pantano has stepped up and provided that for head coach Steve Markie, both on and off the field. Of course, it also helps when she comes through in the clutch, stealing a win like she did against Middletown when the defense behind her struggled with errors, only to be rescued by their steady-armed pitcher. The Indians were proud of Pantano too, who has been an anchor for Newington throughout the season so far, and will need to continue to do so if the team wants to fulfill its state tournament aspirations. 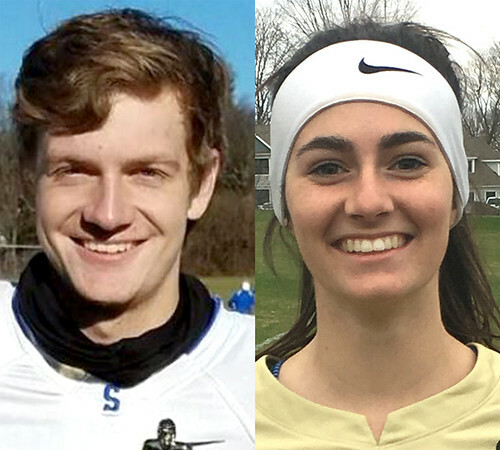 Posted in New Britain Herald, Athletes of the Week, Newington, Southington on Monday, 15 April 2019 20:32. Updated: Monday, 15 April 2019 20:34.